Want to drive like a Champ? Rest assured this car has proven itself immensely with winning the World Championship on its debut as well as placing more Yokomo cars in the top 30 among other manufacturer. Very happy with the service. Got the correct parts and were delivered promptly. This kit includes the pitch control kit. Very good deal! More than a week late. Paid for 6 day shipping too. You gave good service at a good price, i'll be shopping with you again soon. Yokomo Co. Ltd is a Japanese company from Adachi, Tokyo that specialize in radio-controlled cars, it was one of the first manufacturers in Japan to build RC cars and it also invented the RTR (Ready To Run) cars, but most notable of all is their long-running "Dog Fighter" series of radio controlled buggies, mainly through its successes in racing. The company, who would be renamed Yokomo, which is a combination of the two words, Yokobori Mokei, soon began producing its own competition RC cars in 1977 with the Mini Racer RC-12. The Porsche 917/30 that was bodyshell of the kit later formed the basis of the company's Can-Am car styled logo. Its biggest break was in 1983, when it introduced the YZ-834B, the first of the long-running "Dog Fighter" series of 1:10 off-road buggies. 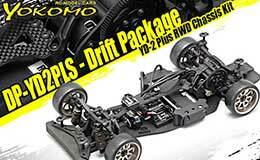 Yokomo are also known for the infamous and very rare YR-F2 chassis line. Despite being a full time front-wheel drive RC, the YR-F2 is banned from certain racetracks as it was too fast for other RC's. 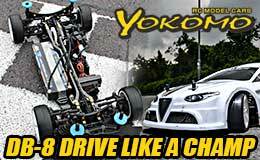 In 2003, Yokomo broke the R/C car mould further, when they introduced radio-controlled drifting with a series of cars that was built especially for drifting. Yokomo recently partnered with Tomy in 2008, releasing a series of miniature R/C cars based on its licenced D1GP and drifting cars similar to its R/C line.